Time now for a home-viewing recommendation from our film critic, Bob Mondello. 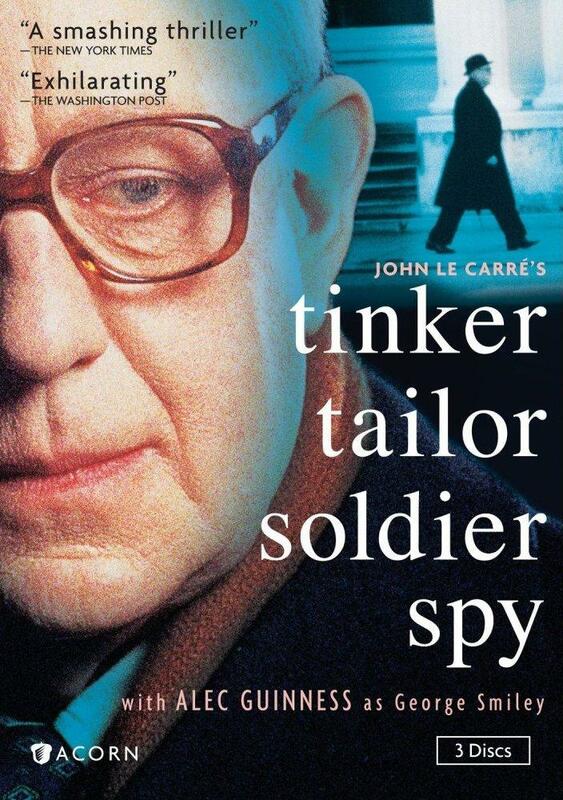 With a new movie version of Tinker Tailor Soldier Spy opening this week, Bob's suggesting the TV original. At some point in my youth, I must have known the nursery rhyme "Tinker, tailor/ soldier, sailor/ rich man, poor man/beggar man, thief," but since 1979, the instant someone says "Tinker Tailor," the next two words that occur to me are "Alec Guinness." In the BBC's six-hour miniseries, Guinness brought deadpan wit to the character of George Smiley, a middle-aged ex-spy who's been forced into retirement, and who swears he wants to stay there, though from the way he swears it, you'll guess he's not really anxious to settle down in a cozy little cottage in the Cotswolds. As it happens, his former employers need him to anchor an investigation that has to stay secret even from its own secret agents. There's a Soviet mole in the highest ranks of British intelligence, and Smiley is brought back to root him out. The miniseries takes its sweet time laying out plot points — a luxury the new movie doesn't have. Happily, that allows Guinness to do some plummy philosophizing (in one instance while interrogating a mute and startlingly young Patrick Stewart who never gets to show off his own plumminess). Lives are on the line, and principles too, but like the John Le Carre novel it's based on, Tinker Tailor Soldier Spy is the antithesis of a James Bond spy fantasy. No flashy gadgets or heroics, just workaday folks expertly plying their trade, be they undercover agents or understated actors. Time now for our latest home video recommendation from critic Bob Mondello. With a new movie version of "Tinker Tailor Soldier Spy" opening this week, Bob suggests dusting off the earlier TV version. BOB MONDELLO, BYLINE: At some point in my youth, I must have known the nursery rhyme, "Tinker Tailor, soldier, sailor, rich man, poor man, beggar man, thief." But since 1979, the instant someone says, tinker tailor, the next two words that occur to me are Alec Guinness. ALEC GUINNESS: (as George Smiley) I've been reviewing my situation in the last half hour of hell and I've come to a very grave decision. MONDELLO: In the BBC's six-hour miniseries, Guinness brought deadpan wit to the character of George Smiley, a middle-aged ex-spy who's been forced into retirement and who swears he wants to stay there, though from the way he swears it, you'll guess he doesn't really want to settle down in a cozy little cottage in the Cotswolds. GUINNESS: (as George Smiley) I shall establish myself as a mild eccentric - discursive, withdrawn, but possessing one or two loveable habits, such as muttering to myself as I bumble along innocent pavements. I shall become an oak of my own generation. MONDELLO: The thing is, his former employers need this particular oak to anchor an investigation that has to stay secret even from its own secret agents. There's a Soviet mole in the highest ranks of British intelligence and Smiley is brought back to route him out. GUINNESS: (as George Smiley) It's the oldest question of all, George. Who can spy on the spies? MONDELLO: The miniseries takes its sweet time laying out plot points, a luxury the new movie doesn't have. Happily, that allows Guinness to do some plummy philosophizing. In one instance, while interrogating a mute Patrick Stewart, who never gets to show off his own plumminess. Lives are on the line, principles, too, but like the John Le Carre novel it's based on, "Tinker Tailor Soldier Spy" is the antithesis of a James Bond fantasy. No flashy gadgets or heroics, just workaday folks expertly plying their trade, be they undercover agents or understated actors.